The early morning of Saturday, June 22, a thunderstorm crashed through Northern California. My partner Adam and I were awakened by the shaking thunder and lightning right above us in Redwood Valley. My first thought was, “Great, we’ll get a little water!” The storm did not last long, but it’s damage was done. I hear we received only a tenth of an inch of rain, but it may have saved us from being enveloped by the Lightning Complex Fire in Mendocino County and many other counties in California. Over 35,000 acres of dry vegetation have burned so far, and the smoke around the county is still thick. Many are wondering how this will affect the grapes, already injured by the harsh frost in March. I farm at Quetzal Farm in Santa Rosa during the weekdays, and every weekend, I visit Adam in Redwood Valley to help him with his animals and work on our upcoming winter vegetable CSA. This past weekend, the smoke hit my lungs hard when I stepped outside. We wore masks anytime we were outside working. Adam had gotten behind in some of his projects as the usual summer threat of wildfires had become quite urgent, so I was happy to help him with chores. Wildfires can spread up to 35 mph, and there were a couple fires not far from us. All week, Adam weed wacked and dug fire lines around his house and garden, watered down the field where his sheep are corralled and his chickens are pasturing, and bought a spiffy backpack sprayer. I heard that the fairgrounds were taking in people’s animals in case they needed to evacuate. At our CSA farm site, we could see helicopters carrying buckets of water, some which probably came from our irrigation ponds. 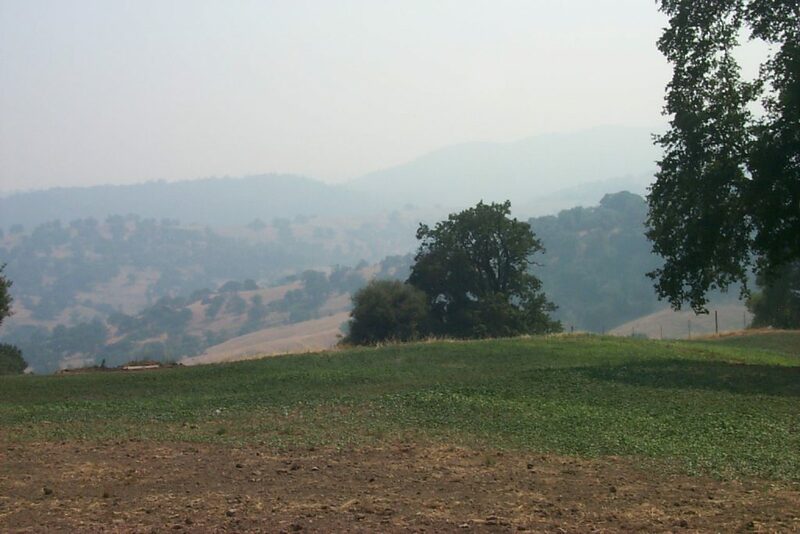 If a fire were to ambush our valley, I decided that I would evacuate all the dogs, but we would just have to hope for the best for the livestock – hope that smoke inhalation would be the worst that would happen to them. South in Santa Rosa, all we really had to deal with was poor air quality for a couple days. I’m anxious that we are having wildfires earlier than usual and am disappointed that this past winter did not deliver as much rain as it has in the past. However, more than ever, Mendo residents are wanting local, organic/biodynamic produce which we are more than happy to provide for them. With food and gas prices continuing to rise, buying local high-quality vegetables and meat from small-time farmers like Adam and myself is a worthwhile investment. And we love growing the food – amidst natural disasters and all. Nature can nourish us with its rich soils, hearty animals and the bright sun, and its dynamic character creates an exciting challenge with beautiful rewards when it is on our side. For now, I will continue learning as much as I can farming in Santa Rosa (and causing confusion as the “ambiguous gringa” – the sole Asian American working with “the Mexicans” and “the gringoes.”) Hopefully, I will be as prepared as I can be to co-manage the CSA in Redwood Valley this fall with whatever new challenges the heavenly Mendo land puts before us. new rabbit roast date>>16/17 august!!! patriots of the land celebrate!